The worlds 1st electric 6 wheel utility vehicle. The E-Raptor is designed and engineered as an environmentally friendly, reliable workhorse. 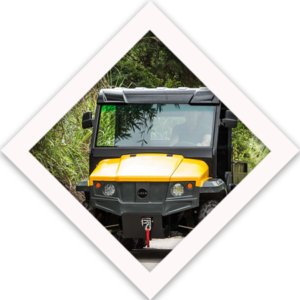 It is especially designed to carry heavy workloads as required by industrial and agricultural users, whilst being versatile in on-road and off-road conditions. With Spiral Sprung Suspension Technology as standard, the E-Raptor can display excellent driving control whilst carrying its maximum load weight of up to 1200kg. The steering control is optimised to allow comfortable handling, minimal turning circle radius and excellent manoeuvrability. The E-Raptor is supplied with Intermediate tyres as standard however on-road and off-road tyres are available. The E-Raptor is fully customizable by vehicle integrators and can be ordered in a suitable form to allow easy and safe customisation. 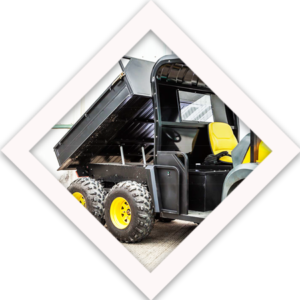 The vehicle is designed to be highly customisable with add on or removable cab & Windscreen and rear bed. Available in Yellow or Red as standard and other colours on special request. 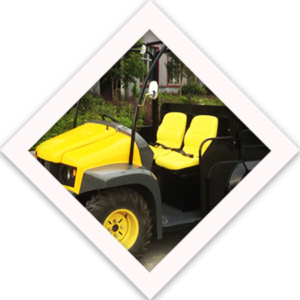 Commonly customised into fire fighting vehicles, Medical Vehicles and Maintenance/ utility vehicles.